Why buy at Classic Auctions? A bit of a mystery, we have a Montreal Canadiens jersey that was worn by a player during training camp in the mid-to-late-1990s with the surname “Edmond”. 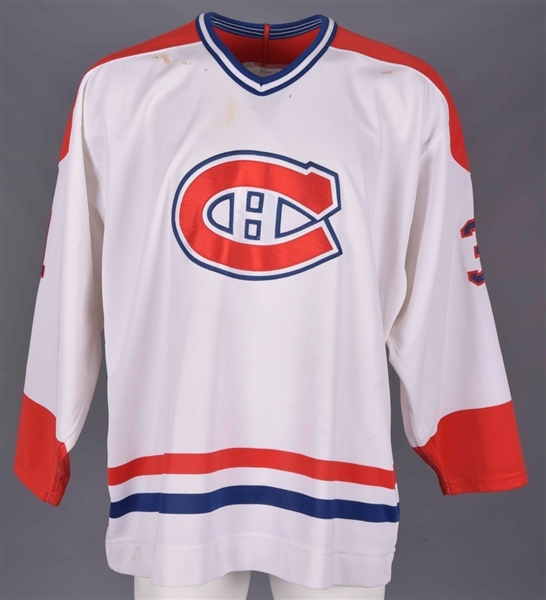 With evidence visible of a former shorter nameplate, this jersey was possibly worn first by Ed Ronan, who wore the #31 sweater for the Habs in both 1993-94 and 1994-95. A Maska Ultrafil label and size “54” fly tag remain affixed to the collar, with embroidered CCM and NHL crests over the reverse bottom hem. Styled with the most famous team crest in hockey, “31” appears over the sleeves and verso in blue-over-red tackle twill, with “Edmond” across the affixed nameplate in single blue twill. A few rust-coloured stains are visible beneath the front collar, with a few dark marks over each sleeve. There is also pilling in numerous spots, along with both red (left sleeve) and blue (reverse hem) paint transfer. A team LOA will be included, signed on behalf of the Canadiens by Rejean Houle. Auction closed on Wednesday, February 27, 2019. Customers who have already registered in the past do not need to do so again. Usernames and passwords will remain valid. Customers who have forgotten their passwords should simply contact us by phone or by email. You may register online at www.classicauctions.net or by phone at (450) 638-7058. New bidders are required to register before Monday, February 25th, 2019. You may begin bidding as soon as you receive your catalog. Phone bids will be accepted at (450) 638-7058 Monday through Friday between the hours of 10:00 AM and 5:00 PM. On the final week of the auction, the office hours will be increased for your convenience. The bid amounts placed in this sale at www.classicauctions.net are also referred to as the hammer prices. A Buyer’s Premium will be added to the winning bid (the hammer price) and is payable by the purchaser as part of the total purchase price. The Buyer’s Premium for the auction will be 19.5% if payment is made by cashier’s check, bank draft, certified check, money order, wire transfer, cash, or by Visa or MasterCard credit card up to $7,500 CAN / US for returning customers only, within 14 days of the date of invoice. The final day of bidding for this entire auction is Tuesday, February 26th, 2019. The initial bidding period will close at 9:00 PM (Eastern Standard Time) on Tuesday, February 26th, 2019. You must place an initial bid on an item before 9:00 PM on auction closing night to be eligible to bid on that item during the extended bidding period that starts at 9:00 PM. This means that if you have not bid on a particular lot before 9:00 PM you may not bid on that lot after 9:00 PM. Therefore, if you are the only bidder on a lot at 9:00 PM you will be instantly declared the winner. Please take note that special rules apply to lots 88-103 inclusively and lots 753-833 inclusively. After 9:00 PM, the auction will continue until the bids stop coming in for 5 minutes. This rule applies to the entire auction and to all the lots. In other words, all lots will remain opened for as long as a bid has been placed on any item and all the lots will close at the same time. Only the application of the 5 minute rule will determine the time of closing. During the extended bidding period, all new bids reset the auction countdown to 5 minutes. The auction ends when no new bids are entered for a full 5 minutes. Our auctions generally go on well into the night, if you do not want to stay up late please refer to “placing absentee bids” paragraph. We encourage early and absentee bidding if you are unable to bid by phone or internet and do not want to stay up late on the final day of the auction. Absentee bids can be left on our web site at classicauctions.net. We at Classic Auctions Inc. will place bids on your behalf up to these amounts only as they are bid against competitively by other bidders. All absentee bids will be treated on a first in, first served basis. If we receive two absentee bids of the same amount, the first one received will be the standing bid. For example, assume you have the current high bid at $5,000 and you have placed an absentee bid of $10,000. If another bid comes in ($6,000), your absentee bid will automatically kick in and raise the high bid to $6,600. This will continue until your absentee bid has been outbid. If there are no other bids, you will win the lot for $6,600, plus buyer’s premium. A 19.5% buyer’s premium will be added to all winning bids. All absentee bidding will remain confidential. Items will be sold to the highest bidder. Bids can be no lower than the "RESERVE" or minimum bid (in US funds) listed in this catalog. The current high bid must be raised by a 10% increment. Classic Auctions Inc. reserves the right to accept or refuse any or all bids. By placing a bid in this auction, the bidder confirms the acceptance of all the rules and conditions of sale as mentioned here. Classic Auctions Inc. record of final sale shall be conclusive. 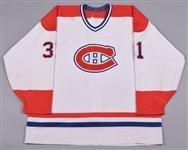 Classic Auctions Inc. will be offering a call back service to the bidders in this historical hockey memorabilia auction. You can request a "call back" on any lots that you have bid on. If your bid has been topped, we will give you a call to let you know. IMPORTANT: We cannot guarantee that we will call you back because of the hectic nature of this auction. Please check on your items regularly if you want to be 100% sure. We also suggest that you use the absentee bid as a further assurance that your bids are protected. Make sure you leave us the correct information on how to reach you for the call backs that will begin at 9:00 PM of the closing date. A 19.5% buyer’s premium will be added to each piece on your invoice. Winning bidders are responsible for the shipping and handling costs which include shipping, packing and materials. Winning bidders are also responsible for any other costs related to shipping: customs, duties, taxes or brokerage that might become payable upon delivery. Shipping is calculated using the dimensional weight of the final package(s) and may vary according to the destination and shipping method. Upon demand, we’ll be happy to provide you a shipping quote using your destination city & postal code (zip code). Please note that shipping cost does not include insurance. Such insurance, if available, can be added to your invoice upon request by email or phone. All items in Canada will be shipped using ground or air service via Purolator unless prior arrangements have been made. Please note that couriers will not deliver to Post Office Boxes (PO Boxes). All items in the United States will be shipped using ground or air service via Express Postal Services or Fedex. Please be advice that some shipments may require the use of a Custom Broker and an ultimate consignee identification number to clear customs. This requirement was introduced on October 1st 2004 by the Customs and Border Protection (CBP) in order to target shipments for closer scrutiny and anti-terrorism purposes. Please contact us for more information. All items shipped to International destinations will be shipped using air service via Express Postal Services. All packages will be sent with a tracking number. Goods can also be picked up, by appointment only, directly at our office located at 215, St-François-Xavier, Suite #104 in Delson, Quebec, Canada. In such case there will be no shipping charge but the item does need to be prepaid in order to pick it up. Please contact our office to make pick-up arrangements. Canadian residents must add 5% GST tax to their invoice including shipping. Quebec residents must add the 9.975% provincial tax on top of GST and shipping. Residents of Ontario must add the 13% HST to their invoice. Residents of Prince Edward Island, Nova Scotia, New-Brunswick and Newfoundland and Labrador must add the 15% HST to their invoice. All items will be accompanied with a 10-day return policy which is only valid if the description of the item was not proper. We recommend that you ask all the important questions on the items before the final auction date to eliminate all risks of conflicts. Once again, returns will only be accepted if the merchandise received does not correspond to our description and for no other reason. Auctioneer shall not be liable for breakage of glass or damage to frames (patent or latent); such defects, in any event, shall not be a basis for any claim for return or reduction in purchase price. Title shall not pass to the successful Bidder until all invoices are paid in full. It is the responsibility of the buyer to provide adequate insurance coverage for the items once they have been delivered to a common carrier or third-party shipper. Please note that your invoice, payment status and tracking information are now viewable online by logging into your account and selecting the “my account” tab. Invoices will be sent by email to the winning bidders. Those who have not received their invoice within 5 days of the auction’s closing should contact us. All invoices should be paid in full within 14 days of the close of the auction. Failure to pay invoices promptly will result in the suspension of your auction privileges. The unpaid balance of any invoice, which is not paid in full when due, will bear interest at the highest rate permitted by law, from the date of invoice until paid. Any invoice not paid when due (within 14 days of the close of the auction) will bear a 3% late fee on the invoice amount. If the Auctioneer refers any invoice to an attorney for collection, the buyer agrees to pay attorney’s fees court costs, and other collection costs incurred by the Auctioneer. If the Auctioneer assigns collection to its in-house legal staff, such attorney’s time expended on the matter shall be compensated at a rate comparable to the hourly rate of independent attorneys. Methods of payment accepted are cashier’s checks, bank drafts, certified checks, money orders, wire transfers, cash, or by Visa or MasterCard credit card up to $7,500 CAN / US for returning customers only, within 14 days of the date of invoice. Please note that wire transfers for any amount less than $1,000 will be subject to a $20 processing fee. Payment by Visa or MasterCard credit card is only for returning customers, and only if the full balance is paid before it is due. In other words, you will be allowed to pay your invoice with your Visa or MasterCard credit card if, and only if, you have already purchased something from us in the past and paid with another method of payment, or if you have consigned to Classic Auctions Inc. previously. Please note that in order to complete your payment by Visa or MasterCard credit card, the transaction must be made within the following 14 days after the closing day of the auction, and the invoice’s final total to be paid cannot exceed $7,500 CAN / US. New customers can still pay their account with our regular methods of payment for the initial invoice and will be eligible to use their Visa or MasterCard credit card in future auctions. All you need to do to pay by Visa or MasterCard credit card is to login into your account, select the “my account” tab, select the auction, choose if you wish to pay in USD or CAD funds and then click on the “credit card checkout” button. As for payments in Canadian dollars, Classic Auctions Inc. will be using an average between the buying and selling rate of the US dollar at the time the auction closes. PayPal and personal checks are NOT accepted. Previews can be made available at Classic Auctions Inc. office by appointment only. Previews will be made available as soon as you get your catalog. However, we will be more than happy to supply you with phone or emails descriptions (as time permits). A few lots in the auction are subject to a silent reserve; each of these lots will be clearly noted in our auction catalog and on our web site and the auctioneer (someone specially mandated by the company) may bid, manually or electronically, up to the bid below the reserve amount. Classic Auctions Inc. will stand behind the authenticity of everything it sells for a period of three years from the date of the auction. We, at Classic Auctions Inc., have a baggage of experience in selling historical hockey memorabilia for more than 60 years. We make sure everything we sell is 100% authentic and sometimes we even require the assistance of outside authenticators. We recommend that the clients verify the authenticity of their merchandise if they have any doubts. However, Classic Auctions Inc. will be the final judge of the authenticity of each and every piece it sells. We are not bound by the opinion of outside authenticators and so called experts. Letters of authenticity will be made available for lots which are indicated by LOA in this catalog. Lots indicated with LOA could also mean that there is a letter from a third party included with the lot. Call for more info. Placement of a bid in this auction constitutes acceptance of these terms and conditions. Classic Auctions Inc. reserves the right to charge to the buyer’s credit card any balance remaining on the buyer’s auction invoice 30 days after the date of the invoice without further notice to buyer. Late or non-payment may result in the revocation of bidding privileges for future auctions. Please note: when you bid on an item, you are entering a legally binding contract, indicating that you will pay for your items, plus the buyer’s premium and any additional associated fees (sales tax, shipping, insurance, etc…). Buyer agrees to pay all of Classic Auctions Inc. costs, including attorney’s fees, incurred in attempting to collect any sums due to Classic Auctions Inc. from buyer. The unpaid balance of any invoice, which is not paid in full when due, will bear interest at the highest rate permitted by law, from the date of invoice until paid. Any invoice not paid when due (within 14 days of the close of the auction) will bear a 3% late fee on the invoice amount. If the Auctioneer refers any invoice to an attorney for collection, the buyer agrees to pay attorney’s fees court costs, and other collection costs incurred by the Auctioneer. If the Auctioneer assigns collection to its in-house legal staff, such attorney’s time expended on the matter shall be compensated at a rate comparable to the hourly rate of independent attorneys. En raison du coût élevé relié à l’impression des catalogues nous devons limiter le nombre de photos publiées avec chacun des lots. Toutefois, comme il n’y a aucune limite pour l’affichage de photos sur notre site Internet, nous vous suggérons de le visiter (www.classicauctions.net) afin d’y découvrir des photos ainsi que des informations supplémentaires pour la majorité des lots offerts. Les clients qui se sont déjà enregistrés dans le passé n’ont pas à le refaire. Les noms d’utilisateurs et les mots de passe demeurent valides. Ceux et celles qui ont oublié leur mot de passe doivent tout simplement communiquer avec nous par téléphone ou par courrier électronique. Vous pouvez vous enregistrer sur notre site Internet www.classicauctions.net ou par téléphone au 450 638-7058. Les nouveaux acheteurs doivent s’enregistrer avant le lundi 25 février 2019. Vous pouvez commencer les enchères dès que vous recevez votre catalogue. Les enchères par téléphone seront acceptées du lundi au vendredi entre 10 h et 17 h, au numéro suivant : 450 638-7058. Durant la dernière semaine de l’encan, les heures de bureau seront prolongées pour mieux vous servir. Les montants des enchères placées dans cette vente à www.classicauctions.net sont aussi connus comme prix d'adjudications. Une prime à l’acheteur sera ajoutée à l’enchère gagnante (le prix d'adjudication) et est payable par l’acheteur en tant que partie intégrale de sa facture. La prime à l’acheteur pour cet encan est de 19.5% si le paiement est fait par chèque certifié, traite bancaire, mandat postal, virement bancaire, comptant, ou par carte de crédit Visa ou MasterCard jusqu’à concurrence de 7,500$ CAN / US pour les clients qui par le passé ont déjà effectué des achats chez nous en utilisant une autre méthode de paiement, dans des délais de 14 jours suivant la date de la facture. Le dernier jour des enchères pour cet encan est fixé au mardi 26 février 2019. L’encan se terminera à 21 h pour la période des mises initiales (heure normale de l’Est) le 26 février 2019. Vous devez avoir placé une mise initiale sur un lot avant 21 heures le soir de la fermeture de l’encan pour être en mesure de déposer une mise sur ce lot après 21 heures pendant la période de prolongation (après 21 h). Ce qui veut dire, que si vous n’avez pas déposé une mise sur un lot en particulier avant 21 heures vous ne serez pas autorisé à miser sur ce lot après 21 heures. Par le fait même, si vous êtes la seule personne à avoir placé une mise sur un lot à 21 heures vous serez automatiquement déclarée le gagnant de ce lot. Veuillez prendre note que des règlements spéciaux s'appliquent aux lots 88 à 103 inclusivement ainsi qu'au lots 753 à 833 inclusivement. Pour tous les autres lots, l’encan se poursuivra jusqu’à ce qu’aucune nouvelle mise ne soit déposée sur n’importe quel lot pour une période complète de 5 minutes. Après 21 heures, l’encan continuera jusqu’à ce que les enchères par Internet ou par téléphone cessent pendant 5 minutes. Cette règle s’applique à l’encan au complet et à chacun des lots. En d’autres termes, tous les lots resteront ouverts tant et aussi longtemps qu’une seule mise sera déposée au cours de cette période de 5 minutes sur n’importe quel lot et tous les lots fermeront au même moment. Pendant la période du règlement de 5 minutes, toute nouvelle mise déposée sur un lot quelconque engendrera automatiquement le début d’une nouvelle période de 5 minutes. L’encan se terminera quand aucune nouvelle mise n’aura été placée sur un lot quelconque pour une période complète de 5 minutes. Nos encans peuvent se prolonger jusqu’aux petites heures du matin, si vous ne désirez pas rester éveillez une partie de la nuit, veuillez vous référer au paragraphe (les enchères par procuration). Nous encourageons les enchères par procuration si vous êtes dans l’impossibilité d’enchérir par téléphone ou par Internet ou encore si vous ne voulez pas rester éveillé le dernier soir de l’encan. Les enchères par procuration peuvent être déposées par Internet, via notre site web (www.classicauctions.net). Nous nous chargerons d’enchérir en votre nom au fur et à mesure que d’autres acheteurs surenchériront. Les enchères par procuration seront traitées sur le principe de premier inscrit, premier servi. Si nous recevons deux offres identiques par procuration, seule la première enchère reçue sera valide. Par exemple, si la mise la plus élevée est de 5 000 $ et vous appartient et que vous avez placé une mise par procuration de 10 000 $ et qu’une autre mise est déposée par un surenchérisseur pour un montant de 6 000 $, votre mise par procuration s’appliquera automatiquement au montant de 6 600 $. Cette procédure se poursuivra jusqu’à ce que le montant maximum que vous avez misé par procuration soit atteint. Toutefois, si votre mise n’est pas surenchérie vous serez déclaré le gagnant de l’item au coût de 6 600 $, plus la prime à l’acheteur de 19.5 %. Toutes les enchères par procuration demeurent confidentielles. Les articles sont vendus à l’acheteur qui offre le montant le plus élevé. Les enchères pour un montant moindre que le prix de réserve ou la mise minimum (en devises américaines) spécifié dans le catalogue ne peuvent être acceptées. Pour surenchérir, l’enchère la plus élevée doit être augmentée par tranche de 10 %. Classic Auctions Inc. se réserve le droit d’accepter ou de refuser une enchère. En plaçant une enchère dans cet encan, vous vous engagez à respecter les termes et les conditions de l’encan décrits dans ce document. Le fichier des ventes finales de Classic Auctions Inc. sera considéré concluant et définitif. Classic Auctions Inc. offre un service de rappel pour les acheteurs qui participent à cet encan d’objets historiques de collection de hockey. Vous pouvez demander un rappel pour chacun des articles sur lequel vous avez déjà déposé une mise. Si votre offre a été renchérie, nous vous téléphonerons pour vous en informer. IMPORTANT : dû à la nature trépidante de nos encans, nous ne pouvons cependant pas vous garantir que nous pourrons vous téléphoner. Veuillez donc vérifier vous-même régulièrement l’article qui vous intéresse. Nous vous suggérons par ailleurs d’utiliser la méthode d’enchères par procuration pour vous assurer que vos enchères seront protégées. Soyez également sûr de nous communiquer vos coordonnées exactes si vous voulez participer au service de rappel qui commencera à 21 h, la journée de fermeture de l’encan. Une prime de 19,5% à l’acheteur sera ajoutée à chaque article sur votre facture. De plus, les frais d’expédition sont à la charge des acheteurs gagnants. Ces coûts comprennent le transport, l’emballage et le matériel nécessaire. Les acheteurs gagnants sont également responsables des autres frais relatifs au transport dont les frais de douanes, les droits et taxes ou les frais de courtage en douanes qui peuvent être payables lors de la livraison. Les coûts pour la livraison sont établis en fonction des dimensions et du poids des articles et en fonction de la destination et de la méthode d’envoi utilisée. Sur demande, il nous fera plaisir de vous donner un estimé des coûts d’envoi pour votre colis en fonction de la ville et du code postal associé à la destination. Veuillez prendre note, qu’aucune assurance n’est incluse au coût d’envoi. Sur demande par courriel ou par téléphone et selon éligibilité, une assurance pour votre colis peut être ajoutée à votre facture. Tous les items à destination du Canada seront envoyé via Purolator service surface ou service aérien, à moins qu’une autre entente n’ait été préalablement conclus. De plus, veuillez prendre note que Purolator n’effectue aucune livraison via les casiers postaux (CP). Tous les items à destination des États-Unis seront envoyés via la poste service express ou Fedex. Veuillez noter que pour certains envoi vous serai obligé de soumettre votre numéro assurance sociale et/ou tout autres information à la demande de l’Agence des douanes. Ces procédures ont été établies par le bureau des douanes et de la protection des frontières et sont en vigueur depuis le 1er octobre 2004 dans le but de détecter et prévenir tous actes de terrorismes. Pour plus de détails à ce sujet, nous vous prions de nous contacter. Tous les items à destination Internationale seront envoyés via la poste service express. Tous les colis qui seront envoyés à l’International seront accompagnés d’un numéro de suivi. Les clients peuvent prendre possession directement à nos bureaux des articles qu’ils ont gagnés. Le ramassage peut se faire sur rendez-vous à nos bureaux situés au 215, St-François-Xavier, suite #104 à Delson, Québec, Canada. Dans ce cas, aucun frais de livraison ne sera facturé mais la marchandise doit avoir été prépayée pour être ramassée. Veuillez communiquer avec notre bureau pour prendre des arrangements en ce sens. Les résidents du Canada doivent ajouter 5 % de TPS à leur facture (incluant la livraison). Les résidents du Québec doivent ajouter 9.975 % de taxe provinciale en plus de la TPS et des frais de livraison. Les résidents de l’Ontario touchés par la TVH de 13 % doivent l’ajouter à leur facture en lieu et place de la TPS et de la TVQ. Les résidents de l’Île-du- Prince-Édouard, de la Nouvelle-Écosse, du Nouveau-Brunswick et de Terre-Neuve-et-Labrador touchés par la TVH de 15 % doivent l’ajouter à leur facture en lieu et place de la TPS et de la TVQ. Notre politique de retour dans les 10 jours s’applique pour chaque article acheté, seulement si l’article ne correspond pas à sa description. Nous vous conseillons de bien vous informer sur les articles qui vous intéressent avant le dernier jour de l’encan de façon à éliminer tout risque de conflit. Encore une fois, aucun retour ne sera accepté sauf si l’article livré ne correspond pas à la description. L’encanteur ne peut être tenu responsable pour les bris de vitres ou tous dommages causés aux cadres (qu’elle soit latente ou non); des bris ou défauts, dans quel cas que ce soit, ne peuvent être un motif pour remboursement ou demande de réduction de prix. La passation des titres ne sera complété seulement au moment où la où les factures d’encan ont été payée en entier. Il sera de la responsabilité de l’acheteur de s’assurer que les items et paquets soit assuré adéquatement lorsque l’encanteur les remettra aux transporteurs ou à la compagnie de livraison. Veuillez prendre note que l’état de votre paiement ainsi que le numéro de suivi de votre colis sont disponibles via notre site Internet sous l’onglet « mon compte » une fois votre session ouverte. Les gagnants recevront une facture par courriel. Les gagnants qui n’auraient pas reçu de facture dans les 5 jours suivant la fermeture de l’encan sont priés de communiquer avec nous. Le défaut de paiement entraînera la suspension de vos privilèges d’acheteur. Tout montant du sur une facture qui n’est pas complètement payée se verra imposer le plus haut taux d’intérêt permis par la loi à partir de la date de la facturation de ladite facture jusqu’à son paiement complet. Toute facture impayée dans les délais prescrits (dans les 14 jours suivant la réception de celle-ci) se verra imposée une pénalité de retard de 3%. Si l’encanteur doit remettre une facture à un avocat pour recouvrement, l’acheteur s’engage à payer à l’encanteur tout frais légaux, incluant les frais de cours, ainsi que tout autres frais encourus. Si l’encanteur assigne le recouvrement à son département légal à l’interne, l’encanteur sera compensé à un taux horaire comparable à celui du taux horaire d’un avocat indépendant. Nous acceptons les modes de paiement suivants : chèque certifié, traite bancaire, mandat postal, virement bancaire, comptant, ou par carte de crédit Visa ou MasterCard jusqu’à concurrence de 7,500$ CAN / US, pour les clients qui par le passé ont déjà effectué des achats chez nous en utilisant une autre méthode de paiement, dans des délais de 14 jours suivant la date de la facture. Veuillez noter qu’un frais de traitement de 20$ sera applicable pour les virements bancaires de moins de 1,000 $. Le paiement par carte de crédit Visa ou MasterCard est seulement disponible pour les clients qui par le passé ont déjà effectué des achats chez nous en utilisant une autre méthode de paiement, ou qui ont déjà été consignataire chez Classic Auctions. Il est à noter que le paiement par carte de crédit Visa ou MasterCard doit être effectué dans les 14 jours suivant le jour de la fermeture de l’enchère, de plus le montant total de la facture ne doit pas dépasser la somme de 7,500 $ CAN / US. Les nouveaux clients devront, lors de leur première transaction, utiliser les méthodes de paiement traditionnelles mais pourront s’ils le souhaitent payer par carte de crédit Visa ou MasterCard pour les encans à venir. Pour effectuer un paiement par carte de crédit Visa ou MasterCard, il suffit d’ouvrir une session, allez sous l’onglet « mon compte », choisir l’encan et la devise (USD ou CAD) avec laquelle vous désirez payer et appuyer sur le bouton « soumettre carte de crédit ». Pour le paiement en dollars canadiens, Classic Auctions Inc. établira un taux de change en effectuant une moyenne entre le taux de la vente et le taux de l’achat du dollar américain en date de la fermeture de l’encan. Les paiements par PayPal et les chèques personnels NE SONT PAS acceptés. Sur réception du catalogue, il vous sera possible de prendre rendez-vous à notre bureau pour examiner la marchandise. Cependant, il nous fera plaisir de vous décrire les articles mis aux enchères par téléphone ou par courriel (si le temps le permet). Quelques-uns des lots offerts dans cette vente aux enchères sont soumis à une réserve silencieuse ; chacun de ces lots sont clairement identifiés dans notre catalogue de vente aux enchères et mentionnés sur notre site internet. L’encanteur (quelqu'un spécialement mandaté par l’entreprise) peut manuellement ou automatiquement surenchérir en dessous et jusqu'au montant de la réserve silencieuse sur ces lots. Classic Auctions Inc. garantit l’authenticité de tout ce qu’il vend pour une période de trois ans, à partir du moment de la vente par encan. Les membres de la direction cumulent plus de soixante ans d’expérience dans la vente d’articles de hockey de collection. Nous vous assurons que tout ce que nous vendons est authentique, nous utilisons même les services d’experts indépendants. Nous vous recommandons de vérifier vous aussi l’authenticité de vos articles. Cependant, Classic Auctions Inc. demeure le seul juge pour l’authentification des articles vendus. Nous ne sommes pas assujettis à l’opinion des experts indépendants. Des lettres d’authenticité sont disponibles pour les articles identifiés comme tels dans le catalogue. Ces articles peuvent aussi être accompagnés d’une lettre d’un tiers. Téléphonez-nous si vous désirez plus de renseignements. En plaçant une enchère dans cet encan, vous vous engagez à respecter les termes et les conditions de l’encan. Classic Auctions Inc. se réserve le droit de débiter la carte de crédit de l’acheteur de tout solde restant à payer, 30 jours après l’envoi de la facture, sans autre avis. Pour le retard de paiement ou à défaut de paiement Classic Auctions Inc. se réserve le droit de révoquer vos privilèges en tant que membre et de vous interdire toute participation future à l’un de nos encans. Il est important que vous sachiez qu’en déposant une mise sur un item, vous vous engagez par le fait même à respecter les règlements ci-haut stipulés et à honorer le paiement de vos mises gagnantes incluant la prime à l’acheteur et tous autres coûts pouvant être reliés tels que (les taxes, les frais d’envoi, les frais d’assurance, etc.). Toute facture impayée dans les délais prescrits (dans les 14 jours suivant la réception de celle-ci) se verra imposée une pénalité de retard de 3%. Si l’encanteur doit remettre une facture à un avocat pour recouvrement, l’acheteur s’engage à payer à l’encanteur tout frais légaux, incluant les frais de cours, ainsi que tout autres frais encourus. Si l’encanteur assigne le recouvrement à son département légal à l’interne, l’encanteur sera compensé à un taux horaire comparable à celui du taux horaire d’un avocat indépendant. Please note that your invoice, payment status and tracking information are now viewable online by logging into your account and selecting the "invoices" tab. By clicking this button, you will IMMEDIATELY bid the amount selected. By clicking this button, you will submit this amount as your MAXIMUM (absentee) bid. The auction software will place bids on your behalf up to this amount only as it is bid against competitively by other bidder(s).